Yes I hope we get some of that rain today. I’m really liking these abstractions. You’re welcome and right back atcha, lady! That is cool! I love those colors. I think you are going to be connecting all this color work together with your other drawing interests over time. This is cool stuff, Laura. Aw thanks Kirk. I think of you every time I do one of these. Fireworks at Dusk was the best title ever and so I keep morphing on it. Thanks for your encouragement this morning. Very much appreciated! Best time for fireworks! Wakes you up but good. 😉 Splendid colors! First snowy fireworks and now rainy fireworks! You just keep capturing the magic, lol. Wild color always starts the day out just right. Keep having fun! A big open grassy field. Brilliant sunrise. Burst of rain against the bright sky. Rainbow! I can dig it. Thanks for the imaginary journey :-). Yay! Can you be my PR guru? Lol! Giggles. I was just rolling with your title. You are already doing a brilliant job with PR. 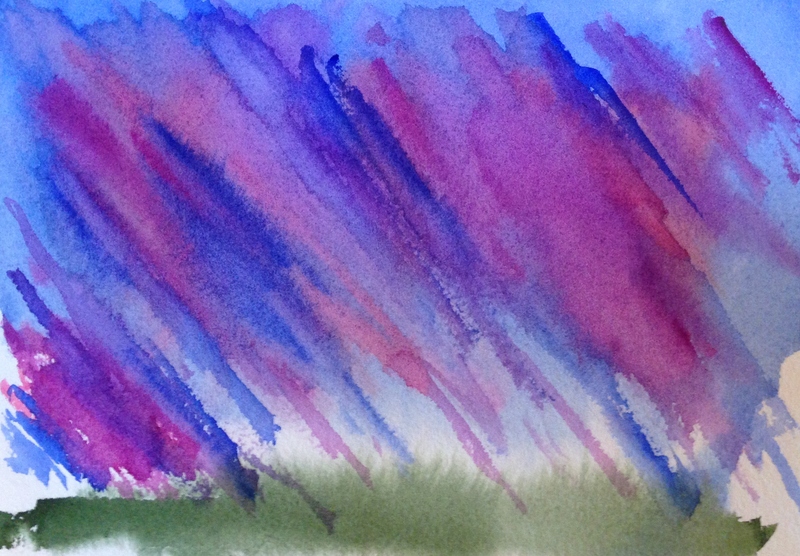 Awesome energy from this painting Laura – the driving rain is only made better with the choice of colors.